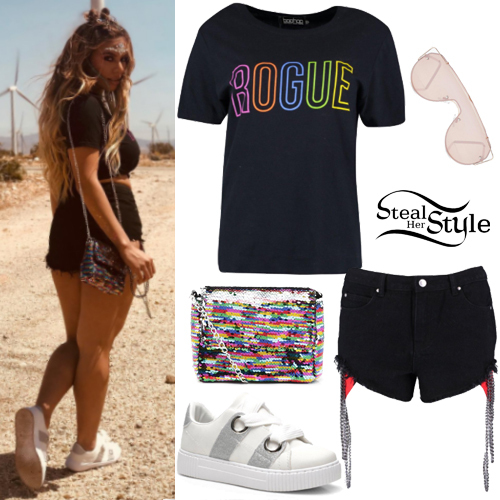 Chantel Jeffries hit up the desert at Coachella Weekend 1 Day 1 with Boohoo today for a shoot, wearing a Boohoo Tanya Pineapple Crop and Short Co-Ord ($23.00) and Poppy Belt Strap Trainers ($11.00). Perrie Edwards posted some pictures on instagram wearing a Brandy Jacket Snakeskin ($100.00) and Brandy Pants ($92.00) both by I.AM.GIA, a Boohoo Frances Basic Bralet ($4.80), i+i Feather Hoop Earrings (£55.00) and Stuart Weitzman Nudist Sandals ($398.00). Chantell Jeffries posted a picture on instagram a few days ago wearing Boohoo Hollie Turtleneck Long Sleeve Bodysuit ($15.00), Brandy Melville Jane Denim Pants ($40.00), a Gucci Super Mini GG Marmont Bag ($890.00) and Gianvito Rossi Piper Leather Ankle Boots ($995.00). Chantel Jeffries posed for her new collaboration with Boohoo. In one shot, Chantel is seen wearing Bandeau Velvet Thigh Split Midi Dress ($34.00), a Nadia Faux Fur Coat ($58.00) and Emma Feather Cross Strap Heels ($52.00). In another shot Chantel wore a Millie Chain Mail Bralet ($25.00), Ella Metallic Sports Stripe Leggings ($25.00), Kayla Luxe Fur Coat ($150.00) and Emma Feather Cross Strap Heels ($52.00). In this shot Chantel is seen wearing a Mila Strappy Tie Back Asymmetric Midi Dress ($34.00) and Louise Chain Detail 2 Part Platform Heels ($52.00). Chloe Ferry posted a picture on instagram today wearing a Louise Sports Stripe Jersey Bodysuit ($10.00) and Rebecca Sports Tape Crepe Trousers ($14.50) both by Boohoo, and Vans Old Skool Sneakers ($59.95). 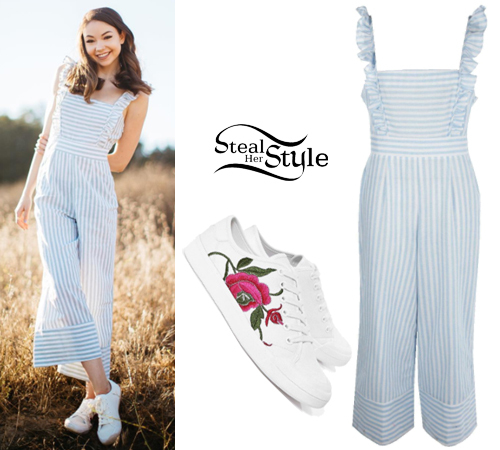 Meredith Foster posted a picture on instagram today wearing a Mia Ruffle Shoulder Striped Culotte Jumpsuit ($44.00) and Amy Floral Embroidered Lace Up Trainer ($40.00) both from Boohoo.